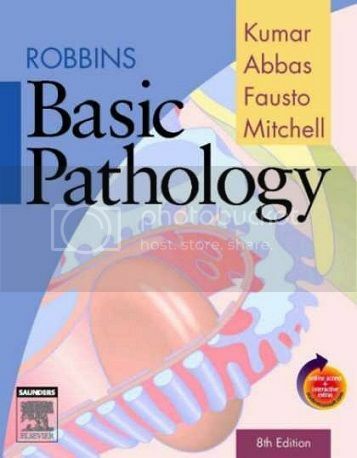 Robbins Basic Pathology 8th | Free eBooks Download - EBOOKEE! Posted on 2014-01-04, by vis87. Get the pathology knowledge you need, the way you need it, from the name you can trust! Robbins Basic Pathology has helped countless students master the core concepts in pathology. This 8th Edition continues that tradition, providing outstanding, user-friendly coverage of the latest information in the field. Clinicopathologic correlations highlight the relationships between basic science and clinical medicine, while state-of-the-art gross and photomicrographic illustrations help you understand complex principles. What's more, access to the complete contents online at STUDENT CONSULT - The Online Medical Library for Students plus USMLE Steps 123 (ver. 2.16) enables you to study more powerfully than ever before! No comments for "Robbins Basic Pathology 8th".